IN THE DESERT outside San Diego, tactical teams assigned to US Customs and Border Protection have been testing eight prototypes for the "great, great wall on our southern border" that Donald Trump has been calling for since the day he began his campaign for president. The panels are 30 feet high and 30 feet long, and cost an average of $450,000 each. They are made of solid concrete or a steel-and-concrete combination. According to Fox News, teams have spent three weeks trying to breach and scale the giant wall sections, "using jackhammers, saws, torches and other tools and climbing devices." So far they have proved virtually impassable. In his State of the Union address last week, Trump repeated his demand for a "great wall" along the border with Mexico. To construct a barrier 1,954 miles long would require 344,000 of those gargantuan slabs. Such a barrier would be "great" only in its brutal ugliness and hideous symbolism. It would be an American version of the monstrous Berlin Wall — and I make that comparison advisedly. Fortunately, such a Schandmauer — wall of shame — will never be built here. For one thing, it is politically untenable. Opinion polls routinely find strong resistance to constructing a border wall. Between 60 and 65 percent of Americans oppose a wall, and they consistently outnumber supporters by nearly 2-to-1. The Wall Street Journal reported last spring that not a single member of Congress from the border regions of Texas, New Mexico, Arizona, and California expressed support for Trump's proposed wall. The estimated price tag for building the wall envisioned by Trump has ranged from $21.6 billion in a Department of Homeland Security study to $70 billion in a report by Senate Democrats. A study published in MIT Technology Review put the cost of a 1,000-mile, 30-foot wall at $31.2 billion. And that's just the construction. Not included are the immense and ongoing maintenance bills. Also not included are the steep legal hurdles. Two-thirds of the land on which the wall would be built belongs to private owners or the states. One long stretch of the border is spanned by territory of the Tohono O'odham, a Native American tribe that implacably opposes a wall. If owners refuse to sell their land voluntarily, the federal government would have to open hundreds of eminent-domain proceedings. That would mean years of litigation, and risk an angry public backlash, before work on the wall could commence. 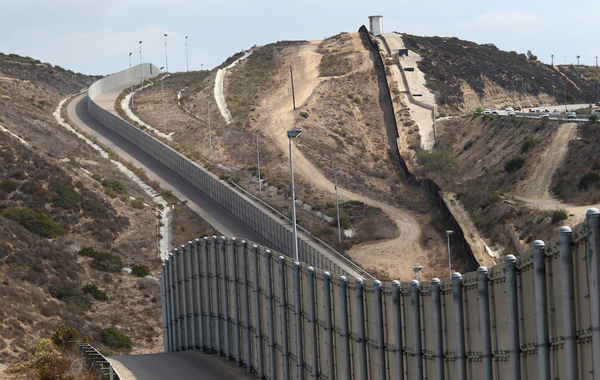 Even if those obstacles could be surmounted, however, Trump's "great, great wall" suffers from a more fundamental problem: It won't prevent illegal immigration. Why not? To begin with, because net illegal immigration from Mexico has ended. The number of migrants coming north across the border has plunged in the past decade, far exceeded by the number returning home. But there's a more pointed reason why a concrete behemoth along the southern border would be ineffective: Most undocumented immigrants don't cross the border illegally. Since 2007, foreigners overstaying their visas, not migrants furtively entering the country, have made up the largest share of people entering the country unlawfully. In 2014, according to the Center for Migration Studies, overstays accounted for fully 66 percent of those who joined the undocumented population. Of the total number of undocumented aliens in the United States today, 42 percent entered on temporary visas and never left. Though the number rises annually by several hundred thousand, few such cases are ever investigated. A mammoth border wall costing tens of billions of dollars won't have the least effect on illegal immigration coming in through airports and seaports. Yet that is how most undocumented immigrants now get in. Which returns me to the Berlin Wall, and why the prospect of an American variant of that monstrosity should sicken anyone who cherishes the United States as a beacon of liberty and decency. Decent nations don't wall themselves off from friendly neighbors with colossal barricades. The day the Berlin Wall finally came down (above) was one of the most joyful in modern European history. Defenders of Trump's wall will bristle at the comparison. The Communists put up the Berlin Wall to keep East Berliners in, they'll object indignantly. The point of Trump's wall would be to keep foreigners out! Perhaps so. But why is that a morally significant difference? 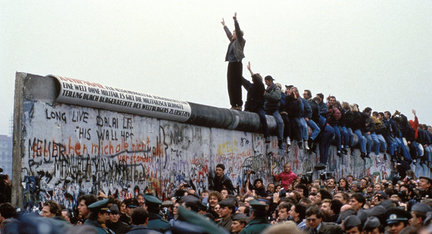 East Germany claimed, absurdly, that its purpose in building what it called the "Anti-Fascist Protection Wall" was not to imprison anyone, but rather to protect its citizens from the corrupt influence of NATO and the West. Suppose, however, that the wall had been put up by the West to keep out East Germans seeking to flee — to "protect" West Berlin from being infected with the taint of Communism and the danger of Stasi infiltration. Same wall, same location, same people targeted: Would it not have been just as hateful? The Berlin Wall operated to trap people who threatened no one and wanted only to improve their lives by moving. Isn't that how Trump's 2,000 miles of towering concrete would operate? Mexico and the United States are not enemies. A massive wall will not make America safer or greater or more sovereign. All it will do is impede the movement of men and women in search of better circumstances. Free and decent nations don't wall themselves off from friendly neighbors with colossal barricades. It's good that most Americans know that, even if their president doesn't.